1. Firefighter Helmet - Most firefighter helmets are made up of 4 key components: a helmet shell, liner, impact ring, and a chin strap. The reasoning behind each part is to provide sufficient protection from falling objects, extremely high temperatures, water or chemical run-off, and shock absorbtion. The helmets have also been designed to be very lightweight, well balanced, and securely fitting so they don't fall off. 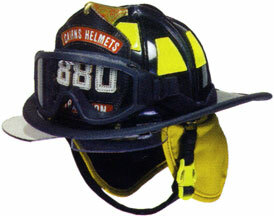 Some firefighter helmets come in an assortment of colors (red, yellow, green, orange, yellow, etc. ), each one representing a specific job function. 2. Fire Suit - A typical fire suit, also known as "bunker gear", is made up of 3 highly sophisticated components: a thermal barrier, a moisture barrier, and a protective outer shell. These 3 combinations mixed with protective pockets of air between each layer create a strong fire-resistant suit that can withstand temperatures of up to one thousand degrees fahrenheit, however, the level of protection against large amounts of steam does not fare so well. A secure fire suit would not be complete without the fire-resistant pants, boots, and helmet to go alongside. 3. 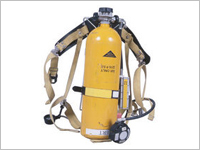 Firefighter Oxygen Tank - A firefighter's oxy tank, also referred to as a self-contained breathing apparatus (SCBA), is a portable tank of oxygen that is worn as a backpack. The air tank is connected to a fire mask that provides fresh oxygen for firemen to breathe so they can still perform under the most extreme environmental conditions, such as rampant wildfires, burning buildings, toxic chemical spills, and smoke-filled areas. Without this critical piece of fire equipment, firefighters would be quite limited in their efforts and would not be able to save as many helpless victims. 4. Fire Axe - The fire axe is one of the most iconic pieces of fire fighting equipment there is because you will rarely see a fireman without one at any fire scene. Most of these axes are made up of an iron head and a halligan shaft, which assist fire crews with breaking down doors, windows, locks, and can even be used as a foothold on rooftops. 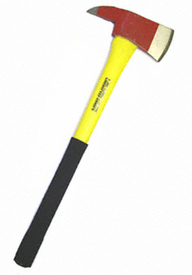 The axes typically come in bright colors such as yellow, orange, and red making them more visible and easy to locate during emergencies. 5. 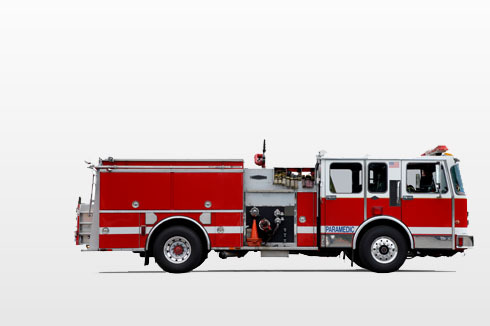 Fire Truck - A fire truck, also known as a fire engine, is the main mode of transportation for the city's fire crews. The fire truck's primary purpose is to haul all of the large fire equipment (ladders, fire axes, hoses, oxygen tanks, cutting equipment, ventilating gear) as well as provide a way to pump water onto burning buildings, which can be done 1 of 2 ways. The first way is to connect a large fire hose to a nearby firehydrant (this is the most common way) and the second option is that some firetrucks are already equipped with an oboard water reservoir which can be used to put out smaller fires such as a burning car. 6. Fire Ladder - Almost every fire truck comes equipped with a fire ladder, the only question is which type of ladder, seeing as how there are over 4 different types. 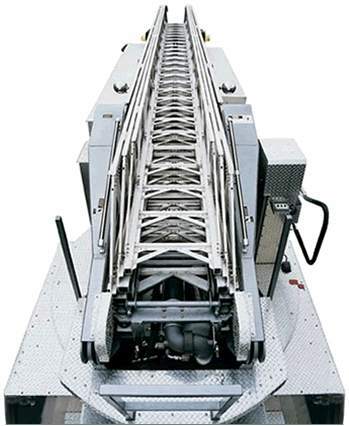 The turntable ladder is the larger sized one that is generally used for rescuing people stuck on a higher level building. The tiller ladder is the more common type that is seen on most fire engines throughout the United States. The other, more advanced fire ladder is the quad ladder, which can be used a variety of different ways, including pumping water from the ladder onto higher up places and serve as an aerial device. 7. 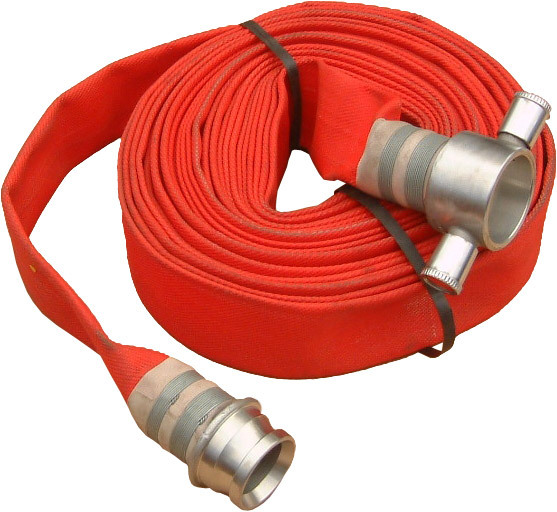 Fire Hose - Certain types of fires call for certain types of hoses and nozzles. For example, some hoses are designed to be more effective against wildfires by streaming less amounts of water at greater distances, whereas on the other hand, some hoses are better against hotter building fires, which require more water in order to extinguish the fire. Since there over 5 different sizes of hoses and nozzles, it's extremely important that firefighters bring the right ones so they can effectively handle any given emergency. 8. Fire Saw - Most firemen crews have several different types of cutting saws as part of their standard fire fighting equipment. Chainsaws can be useful in fighting wildfires by aiding in clearing out flammable trees and brush. Circular saws are sometimes used to help open up locked doors or gates, remove security bars from windows, or even create ventilation on metal roofs. Without the right tools, peoples lives can easily be lost, especially when the only way out of burning homes and buildings is through windows. 9. Fire Fan - Some fire departments choose to use heavy-duty fans or blowers after fires have been extinguished to evacutate toxic smoke and gases from the area. 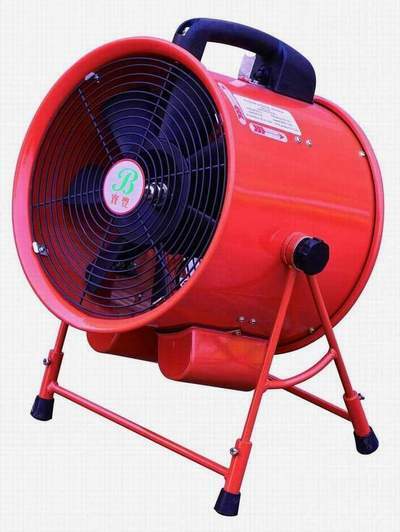 These blowers are quite strong and can push large amounts of air and smoke out of buildings in a matter of minutes. One mistake you never want to make is to use this piece of equipment during a raging fire, since high wind speeds can easily cause fires to jump from building to building and burn at hotter temperatures. 10. Thermal Imaging Camera - This is probably one of the most high-tech pieces of equipment that fire departments use and it is extremely helpful for distinguishing temperatue differences in large fires. 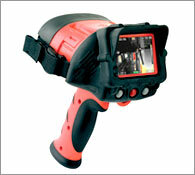 The thermal imaging camera can also be used to search for trapt victims in burning buildings, determine the source(s) of electrical failures, and help fire crews determine the best points entry points, as well as the most effective exit points.